Ron Paul is not a Republican or a Democrat, but a professed Christian and a Constitutionalist. He tried to run on a Republican this past go around but was rejected in favor of Romney. He has historically run as a Libertarian on an Independent ticket. I know a lot of people don’t like his affiliation with the unpredictable pack of angry wolves known as the Tea Party. Keep in mind, he didn’t give birth to the Tea Party, he was just the one in the delivery room. It was raised by men such as Glenn Beck and Alex Jones. 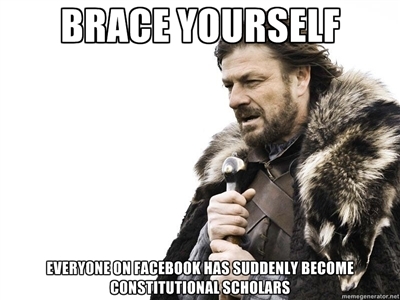 I am not one of those goons who believes that the U.S. Constitution is perfect or holy. I don’t believe the framers had a completely unified vision, and it is arrogant to assume that you know exactly what they desired. Rather, my motivation is that I generally believe that any nation should strongly regard its original constitution or charter, with the exception of any law that the people feel they have ethically risen above. As a Christian, I hold that it is important to keep your word on agreements and respect those traditions which are good and wholesome, meaning that the inter-generational pact that is a nation’s charter should be honored. Of course, because I am a Christian I also hold that my commitment to the Christ and my obedience to the Father supercedes any obedience to any earth-bound pact, so that if in any way I am asked to disobey the Father, I disobey the earth-bound law instead. Having a President that adheres faithfully to the Constitution to the best of his ability makes him reliable and predictable—fewer surprise moves. The U.S. Constitution was about promoting a land of liberty. Most of its ideas were borrowed from post-revolution France. Now, the Constitution writers were also influenced by a heritage of Europeanized Christianity, and a large number of the founding architects wanted Christian teaching to flourish, but if they had wanted Christianity to be the official religion of America they would have explicitly said so. Some liberal interpreters generally need to understand that that the liberties of Christians to proselytize was meant to and should be protected under the Constitution. And yet, conservatives need to understand that it is not the job of of the government to force Christianity in any way, and that if the founders wanted America to be “A Christian nation” they would have actually said so. Saying “God” and “creator” doesn’t actually make the nation officially Christian any more than borrowing from French idealists like Montesquieu make America a province of France. The extent to which America is Christian is only something we can claim in terms of a) a “chunk” of its heritage and b) a size of its population. Besides, the Christ did not die for a religion that needs earthly governments to enforce the church (rather the opposite, ironically), so even if the founders had founded a country calling itself Christian we would have the same issues as England before it—Christians pulled between true Christianity and “Christianity” defined by state powers. It is one thing to encourage religious belief to be practiced publicly, which the many Constitution architects envisioned; it is another to treat a religion like a state religion. (Remember article 6: “No religious test shall ever be required as a qualification to any office or public trust”). Ron Paul is a professed Christian, and he will protect the rights of religious groups, but he is going to stick to the Constitution. I will not expect him to allow the government to hijack Christianity to pursue earthly agendas and win religious crowds over with tainted rhetoric. He believes that public prayer in public schools should never be compulsory, but should not be prohibited either, whether it be the state or federal level. Says Paul, “The Founding Fathers envisioned a robustly Christian yet religiously tolerant America, with churches serving as vital institutions that would eclipse the state in importance. Throughout our nation’s history, churches have done what no government can ever do, namely teach morality and civility. Moral and civil individuals are largely governed by their own sense of right and wrong, and hence have little need for external government.” Ultimately, you can’t legislate morality. You must foster and feed it. Also, Ron Paul promises never to violate habeas corpus, which means that when he is office detainees cannot be unlawfully detained. All prisoners, even illegal immigrants suspected terrorists, will be treated innocent until proven guilty, and not thrown into a jail not-on-the-map and forgotten. They will be given due process and a fair trial. Why? Because it is fair and constitutional. This is what he will pursue as president. Key to many of Paul’s positions is the tenth amendment: For everything Washington isn’t given authority to do, the states handle it (granted its not prohibited by states in the Constitution). If you see Paul as “soft” on an issue because he wants to remove national law covering it, remember that it most likely means he feels that states should handle it. It’s about diffusing power, honoring the charter, and respecting the rights of states to rule themselves. You know how people are starting to realize that we should try better to eat and shop local? Well, shouldn’t we also govern local? It is also a Christian principle. Consider the advice Moses receives from his father-in-law, about delegating decisions to others because he will become overwhelmed. Diffusing power is not only a tool against corruption, but also against stressing leadership into impossible positions. So I am voting for Ron Paul, as a write-in, because neither of the two major candidates respects the US Constitution anywhere near as much as Ron Paul does. Barack Obama has created a capture-or-kill policy that violates the Constitutional rights of Americans. Romney has said that he would not suspend habeas corpus for any US citizen. But then he said he would. So, we’re not sure if he would. (see also this). Ron Paul introduced a bill to repeal the indefinite detention of Americans. With the US Constitution, you can either 1) create an amendment, 2) collectively convince the nation that we should throw off the Constitution altogether and adopt a new one, or 3) Secede your state from the Union and create a new Constitution. But what you should not do is circumvent the Constitution, breaking it and pretending that’s not what you did. When you do this you are breaking the law. Our current President has done so, and I’m convinced his opponent will also. I know Ron Paul will do everything he can not to. This entry was posted in Faith, Polity and tagged america, Barack Obama, constitution, election, habeas corpus, law, legal, Mitt Romney, Obama, Romney, Ron Paul, voting. Bookmark the permalink. I would be more inclined toward Ron Paul if his predilections were more communitarian than libertarian. I’d vote for a Ron Paul/Jill Stein ticket (or vice versa), because it’s only betwxit the two of them that I could envision a non-interventionist America that promotes civic engagement and community governance that is bottom up rather than top down. I find that America’s problems are more a matter of bad governance than bad policy.